The Products: Beads and beading-related items including but not limited to stringing materials, Swarovski crystals, vintage glass, freshwater pearls, buttons, and more. 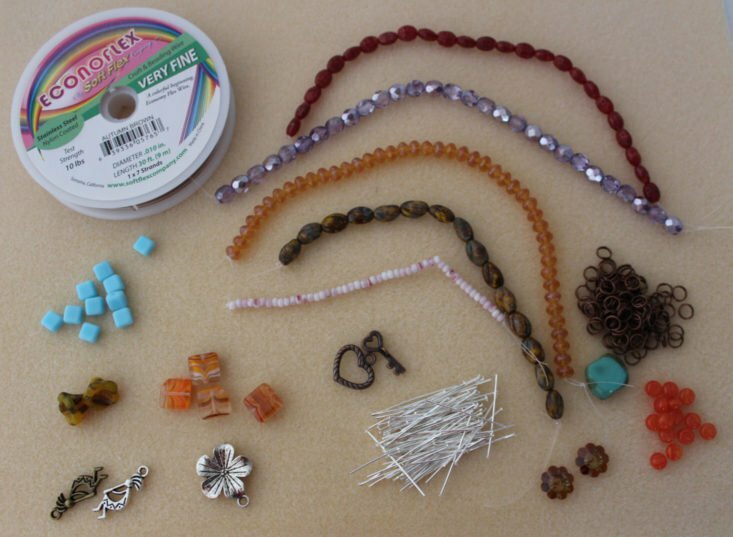 You’ll get a variety of different beads with this subscription. You can count on some strands and Czech glass nearly every month, but half the fun here is seeing what other random things show up. I have a lot of smaller bell flowers in my collection but these are rather large. I used these in a bracelet this month as charms near the clasp. You can see what I did below. I don’t know the materials for anything in this box because I didn’t get the item list, but I am guessing the bulk of it is Czech glass. Anyway, these are one-hole squares with the hole down the center and parallel to the outer edges. These would be good in a delicate bracelet. We got this same item last month, but mine was missing the key part. (It is also possible the folks at Dollar Bead Box saw my review and sent me this one as a replacement.) Anyway, I used this in a bracelet this month. Antique copper is a great finish for fall. You’ll get a lot of one-off charms in Dollar Bead Box. I am actually thinking of making a charm bracelet with them, just kind of an eclectic mix tied together only by metal tone. The finish on these are nice enough, they could definitely be silver plated. Anyway, this is a useful item to have and these will definitely get used. Plus I like not having to buy basics like this because I get them in boxes every now and then. More charms. You’ll get a variety of metal finishes in Dollar Bead Box. These came in two different finishes, one antique silvertone and one antique brass. These are an excellent size for bracelets or buy more from the Dollar Bead Box shop to make earrings. These are almost certainly Czech glass. They could easily be used anywhere you’d use flattish ovals, but if you look at them, you see faint impressions outlining wings and wing spots, which add an extra dimension of interest. You’ll often get a piece or two of genuine Swarovski crystal in Dollar Bead Box and this month it is these margarita/Marguerite Lochrose flowers (I’ve seen them called both names in various places). Just to be clear, this is topaz colored glass and not actual topaz mineral, but this color is usually called something like that. I don’t know if the shape has an official name, they are sort of irregular-looking rondelles. Anyway, I used a lot of these in a bracelet this month, which you can see below. This is a cool color effect. I’d like to see other beads with this color scheme in future months! (Or, a similar banded color effect in other colors would also be nice.) This color goes really well with other items in my collection and I think it would look good with either copper or brass findings. I love flat ovals and squares so I was happy to see these. I like the banding effect here, too. I actually just bought a lot of similar beads off of Etsy because I think the colors are cool. I think these are 8mm but I didn’t measure them, it’s just a guess. You’ll usually get a few strands of beads with this subscription, often sizes and shapes that don’t appear in Dollar Bead Bag. I think this color needs to go with some silvertone findings to really play off the shiny coating. These are tiny, maybe 2 x 3mm (they may look larger in the photo). They’d be good spacers and may work in patterns with a little bit of experimentation. I don’t have split ring pliers but I find these are generally good for attaching clasps or charms to strung pieces because, unlike jump rings, they don’t have a gap where a thread can slip through. I used one this month, though I obviously have a lot left. This color and finish are popular right now and I am happy to see a shape that is not already overrepresented in my collection. I really have quite a lot of coordinating beads and this will be a great centerpiece in a bracelet. These kind of have the shape of coffee beans, I’m not sure if there is another name for them. They are ovals but not really flat and they have grooves that sort of follow the surface/twist of the bead down the center. I used most of these in a bracelet this month. You’ll get a fair amount of stringing material with this subscription (and it really could be nearly anything, from something like this for strung necklaces to a vegan leather cord, silk ribbons, etc.). This is a product line from Softflex I was not previously familiar with but which should work pretty well for stringing projects. Here is a bracelet I made with the topaz nuggets, the coffee bean beads, the bell flowers, the toggle clasp, and one of the split rings from the box, as well as some 10/0 twist hex seed beads from my stash. This is basic right-angle weave and was pretty quick to complete. I like to wear this one with the clasp in the front as I find that side of it to be more interesting. Verdict: I did not calculate a value for the October 2018 Dollar Bead Box, for reasons explained above. There were 17 items (if I counted right) so if you divide the cost of the box by the number of items, it is about $1.15 per item. The mix was eclectic this month, but that’s usually the case, and I would definitely say this was representative of what you would receive in a given month if you were to subscribe. I was in the mood for some fall colors and I found them, but there were plenty of pastels and such as well. Can you still get this box if you sign up today? No, but if there is an item that appeals to you, if you become a Dollar Bead Box member, you can order items from past Dollar Bead Boxes from the Dollar Bead Box shop for $1 each (plus shipping). Value Breakdown: At $19.50 for this subscription, you are paying about $1.15 per item. Check out all of our Dollar Bead Box reviews and the Craft Subscription Box Directory! Visit the Craft Subscription Box Directory for more great beading, craft supply, and DIY project boxes. What did you think of the October 2018 Dollar Bead Box? Do you subscribe to any beading or craft boxes? How do subscribers rate The Dollar Bead Box? Do you subscribe to The Dollar Bead Box? Add your rating now!